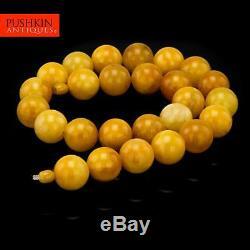 GENUINE NATURAL YELLOW BALTIC AMBER BEADS LARGE NECKLACE 112g. Genuine single row necklace of natural Baltic yellow pressed amber beads, made with genuine and very valuable natural Baltic Kaliningrad amber. The largest bead is 2cm wide. In Great Condition - No Damage. K Bank Transfer Account Name: Pushkin Antiques Ltd Account Number: 53409023 Sort Code: 20-44-22 Bank Address: Barclays, 93 High Road, Ilford, Essex, IG1 1DE International Transfers IBAN: GB36BARC20442253409023 BIC (swift code): BARCGB22. All items are cleaned and inspected before being dispatched; we only use the best packing materials to insure your item reaches you safely. All items are fully insured and sent at the risk of Pushkin Antiques Ltd. The item "GENUINE NATURAL YELLOW BALTIC AMBER BEADS LARGE NECKLACE 112g" is in sale since Thursday, April 14, 2016. This item is in the category "Jewellery & Watches\Loose Diamonds & Gemstones\Amber". antiques" and is located in Ilford. This item can be shipped worldwide.